Many IMF watchers were anticipating a search for a new IMF chief this summer, but for entirely differently reasons than this. The managing director of the International Monetary Fund, Dominique Strauss-Kahn, was taken off an Air France plane at Kennedy International Airport minutes before it was to take off for Paris on Saturday and arrested in connection with the sexual attack of a maid at a Midtown Manhattan hotel, the authorities said. 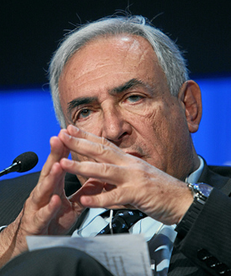 Will DSK resign or be forced out due to this? Share your opinions. Update: This was fast. The IMF Board has met in emergency session this evening to decide next steps in the wake of DSK’s arrest last night. John Lipsky, Deputy Managing Director, was named as Acting Managing Director while DSK is in custody. Lipsky is a former U.S. Treasury executive and Vice Chair at JP Morgan. Just days ago, he announced his intention to step down from the IMF in August.